Our morning game drive was pretty, but we didn’t see much in the way of animals aside from a few bird species we hadn’t seen before. In the afternoon we set out for a water hole to watch the sunset. (For those of you not accustomed to African game drives, the animals are usually most active in the early morning and around sundown. To catch these peak times, we usually leave camp before dawn and drive until about 10am. If we haven’t driven too far, we return to camp and spend a few hours during the day resting, then go out again in the evening. The predators tend to do their hunting at night, so this is as close as we can get to their active times, since we are not allowed to do night time game drives.) Graham and Connie spotted a cheetah lying under a tree near the road and we stopped to watch. It wasn’t long, however, before a couple of safari company vehicles showed up, and the cheetah decided to find somewhere more private. We watched for awhile and didn’t see her again. We set up shop at a different point around the same water hole we were at last night, and were treated to a spectacular display of a herd of about 40 elephants running through the shallow waters at the edge of the hole. They made lots of noise splashing through the water, and by the time they disappeared into the trees at the other side the babies were completely soaked. We’re not sure what spooked them, but the sight of such a number of large animals moving quickly was very impressive. We watched the hippos bathe for awhile (that’s pretty much all they do during the day) and returned to camp just after dark. We alternated between giving a slideshow of our trip for Brian and Debbie and watching a large hyena and her cub prowl around the outskirts of camp, waiting for us to go to bed so they could raid the trash cans. Graham and Connie, on their own, as the rest of us decided to go off on our own this morning, spotted a female cheetah running across the road in front of them. 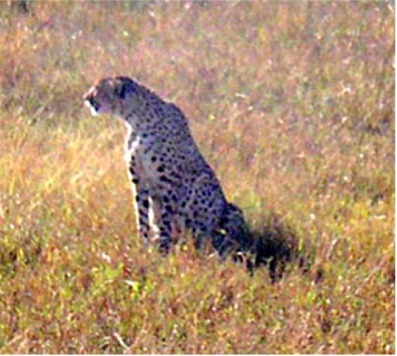 We believe that this is the same cheetah we saw yesterday because she appears to be very pregnant. The cat was headed toward a group of lechwes browsing nearby. 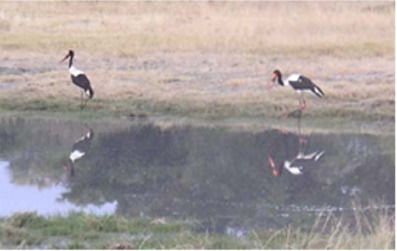 She broke into a sprint after crossing the road, and the lechwes took off toward the shallow water which they prefer to avoid predators. Graham and Connie saw the lechwes splash into the water amid a cloud of dust, and rushed around to the water’s edge to investigate. They arrived in time to see the cheetah with her mouth clamped around the neck of a female lechwe, probably the injured one we saw two days ago. She rested for a few minutes, then dragged her breakfast a few feet away into some taller grass, still no more than twenty feet from the road, and began to eat. Debbie and Brian happened by shortly thereafter, and about 10 minutes later Witt and Jen heard Connie suggest on the radio that they might want to come check it out. We all watched the cheetah devour the lechwe for another twenty minutes or so, then she walked three or four feet away to relax. Fifteen minutes later vultures began to circle. When they started to land, the cheetah returned to her kill to continue eating. The vultures waited impatiently nearby. The vultures attracted the attention of three safari company vehicles that joined us to watch the spectacle. As the cheetah finished her meal, a large (15 feet or so) crocodile approached from the nearby water. The cheetah gave up her kill, probably having already eaten her fill anyway. The vultures got about 20 seconds between the time the cheetah left and when the croc (who didn’t seem to care whether he had lechwe or vulture for breakfast) grabbed what was left of the carcass and headed back toward the water. The frustrated vultures were left with nothing but scraps. The cheetah wandered off into the bush and Brian drove after her, keeping a respectful distance. He was fortunate that she decided to walk alongside a track, allowing him to keep her in sight. She laid down in the shade of a tree to let her meal digest no more than twenty feet from the track. The rest of us joined Brian and we watched her for about twenty minutes before she decided to find some more privacy, walking to another tree to continue her nap. We were elated by our luck and returned to camp for some rest of our own. There are nine photos in this gallary; be sure to click on the arrows to see them all!